Federal Deputy Luiz Carlos Hauly. 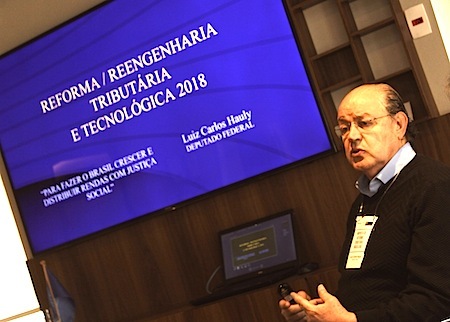 During a São Paulo event in August, Congressman Luiz Carlos Hauly presented tax reforms intended to boost economic growth and reduce bureaucracy and the so-called «Brazil Cost». The main ambition of the reforms is to stimulate economic growth of 5-7 percent a year, with a greater social inclusion, by reducing the concentration of wealth. 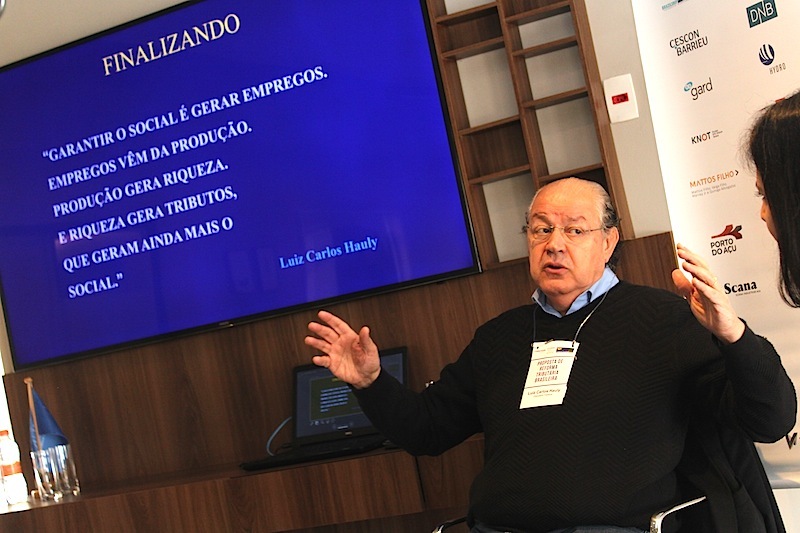 In his presentation, Federal Deputy Luiz Carlos Hauly called the current tax system «one of the most complex of the world with one of the highest indexes of tax evasion. He used words like «disorganized and chaotic» and described the current system as «a madhouse». 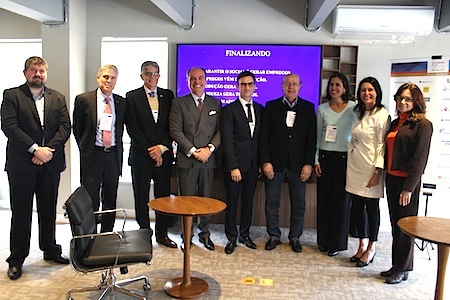 The seminar took place in the offices of Pacheco Neto Sanden Teisseire in Sao Paulo on August 2, 2018, and was organized by NBCC, Finncham and Swedcham. The current Brazilian tax system was created in 1965, and the keynote speaker has been part of different commissions working to reform the tax system since 1991. «The current system reduces the purchasing power of the consumers, and therefore hits the poorest layers of the people much harder. The system is charging twice as much of the poor. It kills companies and destroys jobs. We want the Brazilian tax system to create jobs and generate profits, as well as guaranteeing fair revenues to the states and municipalities», Mr. Hauly said. Studies in fact show that the tax burden on those earning 1 minimum salary a month is close to 50 percent, while those with a monthly income equal to or higher than 30 minimum salaries pay about 20 percent less in taxes. In his presentation Congressman Hauly gave a brief history of earlier reforms, and described the different Brazilian indirect taxes as «Frankensteins» that have completely distorted the tributary system. He also talked about tax evasion as a national sport and about the cost of the Brazilian bureaucracy. The Congressman outlined the current system, where the main pillars, or sources of tax revenues, are taxation of property, consumption and income. «The proposal simplifies taxation on consumption, and makes the union in charge of setting taxes, not the states. The ICMS needs to be nationalized,» he argued. The event was organized by Finncham, Swedcham and NBCC, and all chambers were represented at the event. The proposed reform reduces taxes on consumption while increasing income taxes. There will be tax reliefs on food and medication, as well as on exports, according to the proposal. To see Congressman Hauly´s full presentation and more details on the proposed reform, click here. iv Possibility to include alternative dispute resolution mechanisms as a toll to optimize the settlement of tax disputes. The tax burden will remain 35 percent although some taxes will be extinguished, and the partition between the federation, the states and the municipalities will remain the same. From the left: Daniel Miotto, Congressman Hauly and Marina Bonin. Daniel Miotto, Tax Partner at Pacheco Neto Sanden Teisseire and Marina Naime Bonin, Head of the Nokia tax department in Latin America, were also on the panel at the event. They both questioned the feedback from the states, as fear of loosing tax revenues has barred earlier reform attempts. According to Luiz Carlos Hauly, the proposed reform has support in Congress, and there seems to be a broad consensus on the need for the tax reform. The plan is to vote the reform in stages, and the vote might start within a few months. «The current Brazilian tax system is killing the economy. All the main presidential candidates for the 2018 presidential election are familiar with the proposal, and they understand the urgency of the reform. Without a reform, chaos will continue», Mr. Hauly said.